[This section, which describes the actual Durbar so briefly and with such world-weariness, makes a sharp — and interesting — contrast to the 100 paintings and enthusiastic text of Mortimer Menpes’s The Durbar. Since the artist painted both figures who appear in the illustrations, such as the Sikh priest, and those mentioned in the Punch article, I've added links to the relevant watercolors. 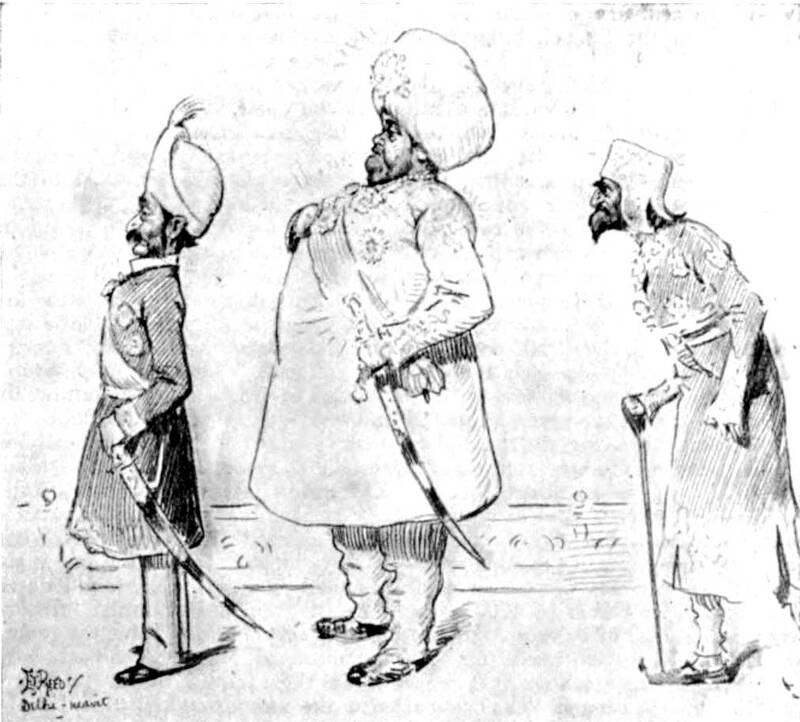 January 8: Viceroy’s Camp, Delhi. The little moon that emerged on the eve of the Durbar was not the simple thing it looked to be. I had always supposed that the appearance of these heavenly bodies was determined a century or so in advance by the almanacks. Yet the sight, of this new moon seems to have come as a surprise certainly it modified the arrangements for the feast of Ramadan and in some obscure way necessitated the postponement of the Durbar by the space of half an hour. Personally I am ill-versed in local creeds, and should myself have thought that a. distinct engagement like the Durbar should not have been affected by anything short of an eclipse. 1 have no further criticism to offer on the proceedings, except that I think that some few score of the salutes might have been taken as fired, or else let off at such a distance as not to delay the action of this imposing drama. For the rest I cannot conceive a more admirably ordered spectacle. The scene in the vast verandahed amphitheatre, opening out across the plain upon a vista of long avenues of foot and horse, British and native, was one to paralyse the pen. Among the happiest effects were the movements of the herald's trumpeters (who blew up STANFORD'S delightful fanfare); the crackle of the feu de joie that raced along the boundary line and back; and the sweep of the pennoned lances of the 4th Dragoon Guards, as they swung into line behind the infantry. The blazing scarlet of our officers’ uniforms paled before the gorgeous velvets and silks and brocades of the Native Princes. The Nizam of Hyderabad and other notabilities playing "The Heavy Lead" in the Grand Spectacle entitled "The Delhi Durbar." The boy Maharajah of PATIALA, looking less than his thirteen years, and wearing pearls to ransom a family of Kings on his little chest, stirred the emotions of the ladies; while many a manly heart beat faster below its fighting medals at the spectacle of the veiled Begam of BHOPAL prostrate before the throne until it was understood that the two stalwarts in her train (both of them, as I hear, too heavy for the mounts of the Imperial Cadet Corps) were the lady's lawful sons. Conspicuous by the reticence of his attire was the Nizam of HYDERABAD, first in precedence of all the Native Princes, and rich beyond the range of human calculation. He and I wore a frock-coat each. I say nothing about myself; but the Nizam has a yellow bodyguard, and is a person of extraordinary importance. He it was who arrived at Delhi Station after sunset on the 24th of December, and, when he found that no salutes were to be fired on Christmas Day, remained splendidly aloof in a siding for some forty hours till he could get what he wanted. English papers will probably have given more space to the Durbar than to any other spectacle of the series. But everybody here has decided that the Review of the Native Chiefs' Retainers, where free play was allowed to Oriental fancy, was the best turn in a remarkable programme. I first caught sight of this motley army and the glint of its gold, a mile away over the plain, as I drove to the amphitheatre yesterday. For two continuous hours it streamed past the throne, doing homage, man and beast, each after his kind elephants saluting with waved trunks or lifted fore-feet, and horses rearing on their hind legs in the best manner of the haute école. 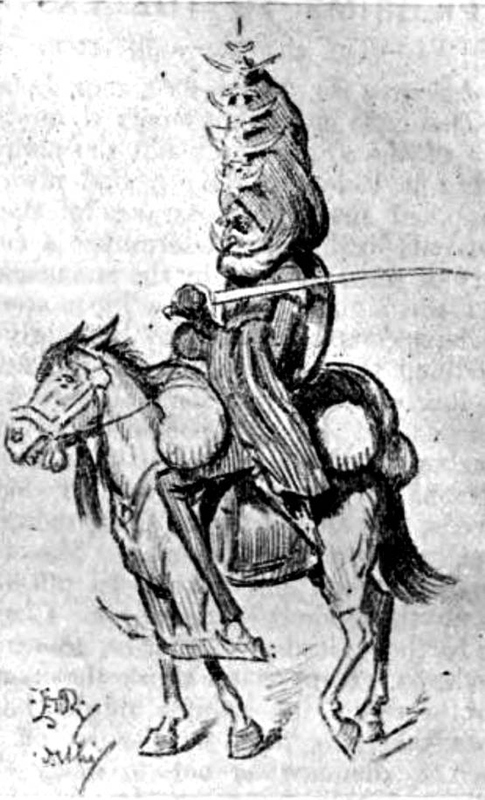 Giants from Kashmir; dwarfs from Nabha and Patiala; four-in-hands of elephants, housed and caparisoned with Oriental recklessness; horsemen in coat-of-mail; lancers with targes slung behind them; drummers mounted on camels; soldier-priests from Jind; masked devil-mummers from Thibet; never was such a circus got together in the history of India. It was a spectacle that an IMRE KIRALFY might see once and die of despair. I hope that these peoples appreciate their own picturesqueness, yet I seemed to detect nere and there what I may call an Occidental rift within the lute. This was naturally most apparent among the native musicians, who in the midst of this barbaric pageant made heroic efforts, not always crowned with success, to render “Annie Laurie” and “Do ye ken John Peel?” I confess that a strange nostalgia overtook me at the sound of these hallowed airs. Another gorgeous spectacle, and one in which, this time, the dominant colour was British red, was presented at the Investiture of the Star of India in the Diwan-i-'Am, at Delhi Fort. I doubt if Shah JEIIAN, of blessed memory, who used it some two centuries and a half ago for his Hall of Public Audience, ever witnessed between its sandstone pillars a scene more brilliant than this. For the first half hour one wanted never to leave it: then the eye grew less alert, and though one was buoyed up for a time with the hope that some of the new Knight Commanders, as they backed from the throne, might cause a diversion by overlooking the downward step that came at the end, the entertainment grew tedious: and when it had to be gone through da capo for the Order of the Indian Empire, many of the spectators frankly slumbered under conditions of unparalleled splendour. But it was all to be eclipsed in a few days when the State Ball was given in the same building, and supper was served to some 3,000 guests, in relays of 400, in the lovely marble Hall of Private Audience, the Diwan-i-Khas, extended for the occasion by a clever scheme that simulated the ancient design. The original Hall, lit from above with electric light, was left unprofaned by wassail, out of regard for the memory of the departed Peacock Throne. 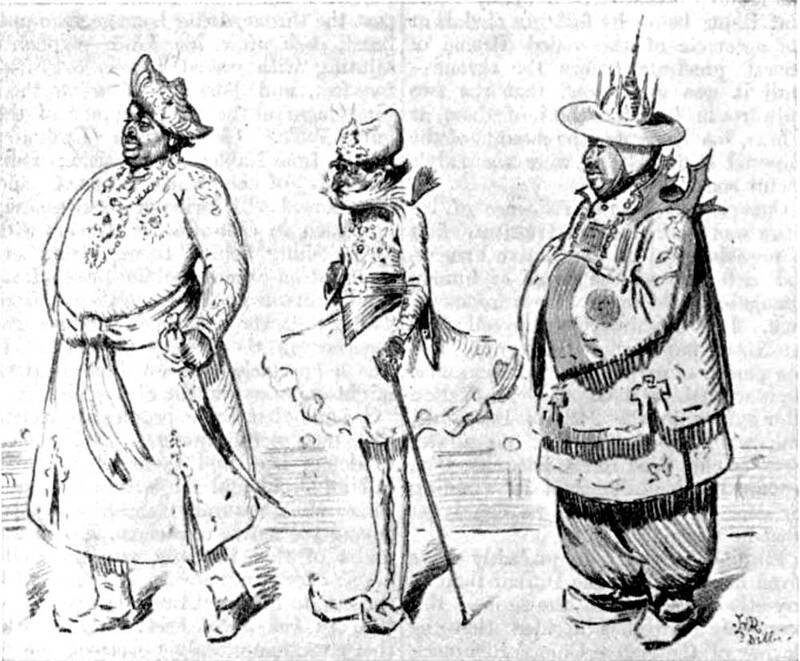 Left: More performers in the Comic Durbar “Ballet.”. Right: A Sikh Priest in Native Review..
On Sunday I attended the State Service on the Polo Ground (club badges not required to be worn). The sermon, by the Bishop of CALCUTTA, was printed beforehand and distributed; and I can testify to his lordship's admirable mastery of his own words. The service was on so gigantic a scale that the choir, stationed beyond roach of the unassisted ear, had to sing through megaphones; and the cues for their responses were conveyed to them by flag-signalling. You will probably have a question asked in the House in connection with the State Entry. A small group of men had disposed themselves in portico, at a corner of the Jumma Musjid, reserved for selected guests of the VICEROY. Gently but firmly requested by an A.D.C. to withdraw, they informed that official, through their spokesman, that the party embraced certain Representatives of the British Electorate. With difficulty concealing the profound impression produced by this statement, the gallant officer courteously hinted that such an appeal, commonly unanswerable, would at this juncture avail them nothing. “England shall ring with this!” was the reply of the outraged Member. Shortly afterwards they retired under protest. I give the story roughly, as I heard it from the Aide who conducted their removal. On Saturday we talk (so sanguine are our tempers) of moving on to Lucknow. Over at least a week of our halcyon time in camp, where every need has been anticipated, the horrors of a general exodus have cast their shadow before. The lethargy, the parsimony, the lack of enterprise of the Railway Companies in India are a perpetual reproach. The Durbar has been their opportunity; it has called forth all their worst qualities, as the sun brings out the adder "and that craves wary walking." Indeed, if the VICEROY'S special fails us, we may yet have to do the journey (not much more than 300 miles) on foot. Still, at a pinch, there are always elephants. 0. S.
“Pilgrims to the East. VI. The Durbar and After.” Punch. (8 January 1903): 77-78. Internet Archive’s online version of a copy in the University of Toronto Library. Web. 6 June 2017.